A Health Care Proxy form lets you choose a person (or more than one person) you trust to make medical decisions for you if you can’t speak for yourself. Not sure who to choose for this critical role? Read our article about how to choose a good health care proxy first. Who needs a Health Care Proxy? Needs 2 witnesses not listed as HCPs (witnesses must be 18+ and cannot be your attending physician). Who needs a copy of your Health Care Proxy form? 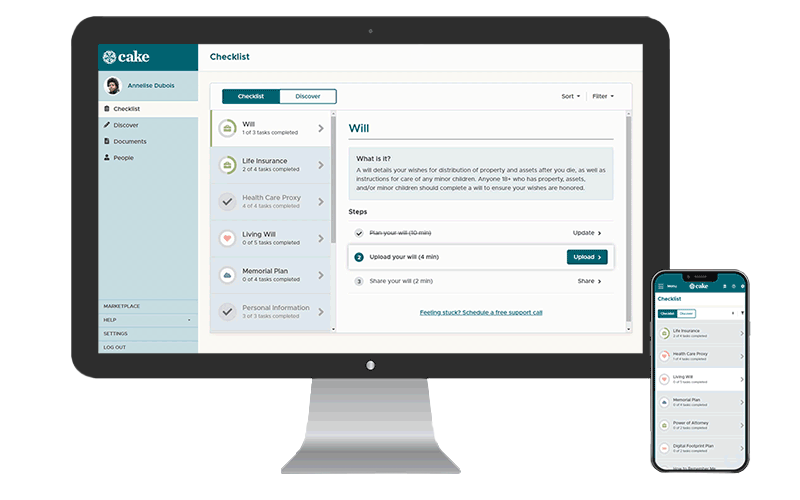 If you use Cake for your end-of-life planning, you can upload a copy of your Health Care Proxy to the Documents section of your account for safekeeping and sharing with your key people. Don’t have an account? Create your Cake account – It’s free. Living Wills are documents that let you express the kinds of medical care you do or do not want to receive at the end of life. It’s important to make sure your preferences are known to 1) make sure your wishes are honored and 2) reduce conflict and guilt among your loved ones if tough decisions need to be made someday. Read more about Living Wills to get a better understanding of how they protect you. Needs a notary or 2 witnesses not listed as HCPs (witnesses must be 18+ and cannot be your attending physician). Distribute copies to your physicians, your lawyer, and your Health Care Proxy. Keep a record for yourself, too. If you use Cake for your end-of-life planning, you should upload a copy of your living will to the Documents section of your account for safekeeping and sharing with your key people. Cake also helps you create a comprehensive Advance Care Plan that addresses more preferences than are covered by a living will alone. Don’t have an account? Create your Cake account – It's free.